So anywhere in the South you go there are the ubiquitious plastic tubs of pimento cheese. The best-known is Mrs. Grissom’s, actually made by Grace Grissom (well, not actually – I think she must be in her 80s by now) and for store-bought stuff it’s pretty good. 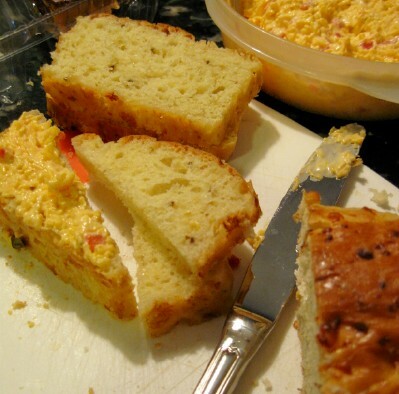 You’ll see pimento cheese sandwiches at every church social, funeral and wedding. They are a requirement. But my friend, Howard Lewis, a travel agent to the stars in Beverly Hills and fellow barbecue judge, went on a search for proper pimento cheese while in Nashville for a barbecue contest. It got me to thinking about what really good pimento cheese should be. I took him to Martha’s at the Plantation, a high-end lunch place run by the well-regarded chef Martha Stamps. She serves a very high end pimento cheese, made with white Cheddar. It was actually too high end. I was disappointed for Howard. That led me to the grail of all things Southern food-wise (on the internet, at least), the Southern Foodways Alliance, a great little outfit run out of the University of Mississippi at Oxford. They collect real-deal Southern food stories, recipes, oral historys in an attempt to preserve the only native American cuisine. And here I found the absolute perfect, utterly delicious pimento cheese recipe ever. Pulse together everything but the mayonnaise and then add enough mayo to create a thick smooth mixture. They don’t have pimento cheese in Manhattan for the same reason they don’t have country ham. Nobody knows what to do with it. I lived in Reno, NV., for five years and we had to import country ham, barbecue and make our own pimento cheese. I promise if you make this recipe you’ll never go back to store-bought anyway. Here’s an appetizer that will convert any Northerner to right-thinking ways: Make your homemade pimento cheese. Get some banquettes and slice them into thin slices. Spread with pimento cheese and bake at 350 for about 10 minutes.